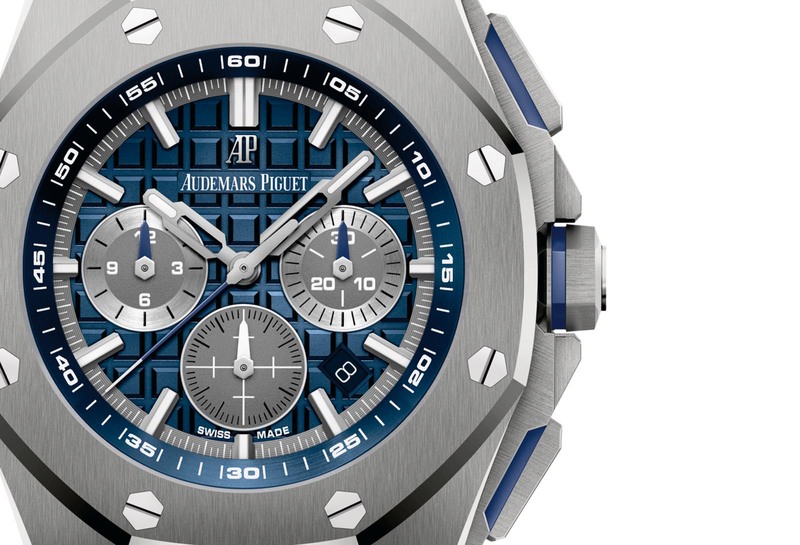 While the Code 11.59 grabbed most of the headlines at SIHH 2019 (with the runner-up being the Royal Oak Extra-Thin “salmon”), Audemars Piguet launched several notable watches that went under the radar. One was the Royal Oak Offshore Selfwinding Chronograph 42mm, which was shown at the fair but not quite officially unveiled. Three qualities set the new Offshore apart, starting with the fact that it’s by far the thinnest Offshore chronograph. Another is the Frederic Piguet cal. 1185 movement inside, which explains its thinness. And last is the new(ish) design language used for the dial and case. The new Offshore has a titanium case that’s 42mm in diameter, but at 12.8mm high it’s a lot thinner than the typical 14.4mm-thick Offshore chronograph. It’s the first Offshore to be equipped with the cal. 2385, previously only found in the Royal Oak Chronograph and the 37mm Offshore Chronograph for ladies. Most other Royal Oak Offshore Chronographs are powered by the cal. 3126/3840, which is Audemars Piguet’s in-house cal. 3120 topped with a Dubois-Depraz chronograph module. The cal. 2385 is actually the Frederic Piguet cal. 1185, or more precisely the Blancpain cal. 1185 since Frederic Piguet was absorbed into Blancpain in 2010. Boasting an incredibly thin profile, the cal. 1185 is a classic of chronograph movement design, an automatic, integrated chronograph, complete with vertical clutch, column wheel and one-piece reset hammer. Though the movement is new, it’s concealed beneath a solid case back, perhaps to conceal the disparity between the large case and small movement. As a result of the movement, the new Offshore sports a “tri-compax” dial layout, with the sub-dials at three, six and nine. The watch also features several other cosmetic tweaks, including a redesigned crown, crown guards and pushers, which are smaller and flatter, giving the case a sleeker outline. 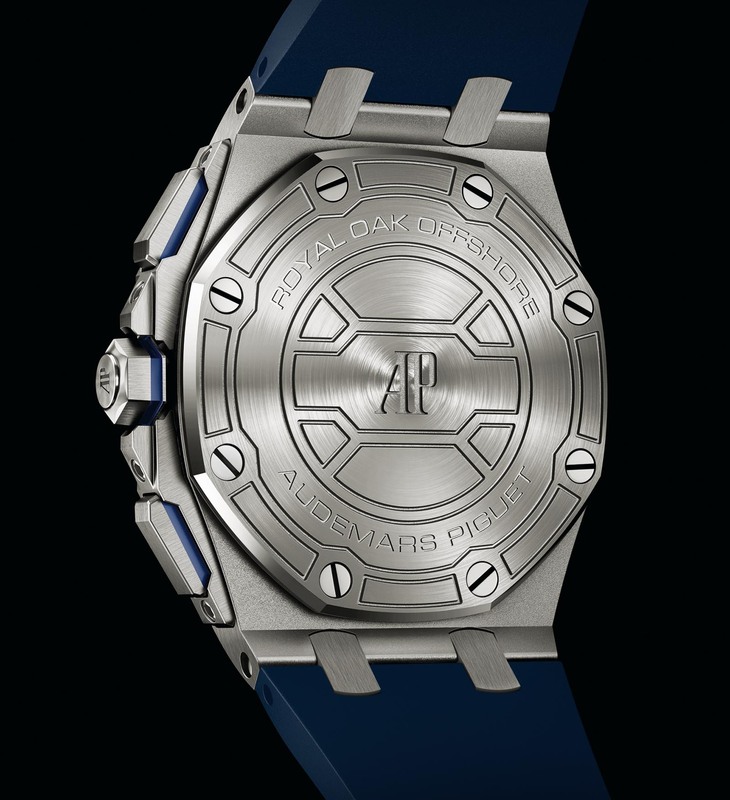 Both the pushers and crown feature a blue ceramic ring at their base to match the dial. As is standard for the Offshore, the dial is finished with a Méga Tapisserie guilloche, done in a dark blue with chronograph grey counters. The flange around the dial has been widened and serves as a minute track instead of a tachymeter scale, which has been done away with. And the hands are an entirely new design – partially skeletonised with luminescent tips – that’s loosely based on the traditional Royal Oak hands. The new design for the hands is also echoed in the reshaped hour markers. 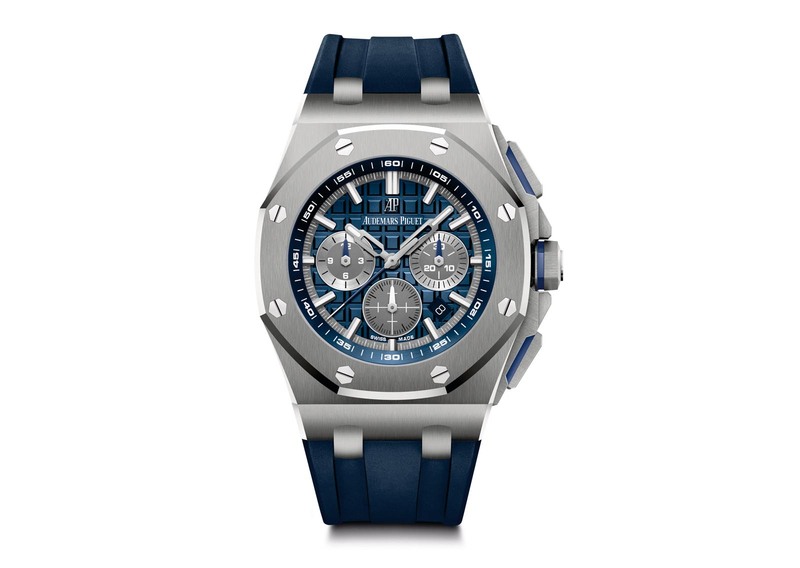 The Royal Oak Offshore Selfwinding Chronograph in titanium (ref. 26480TI.OO.A027CA.01) is priced at US$26,800, or S$37,600. 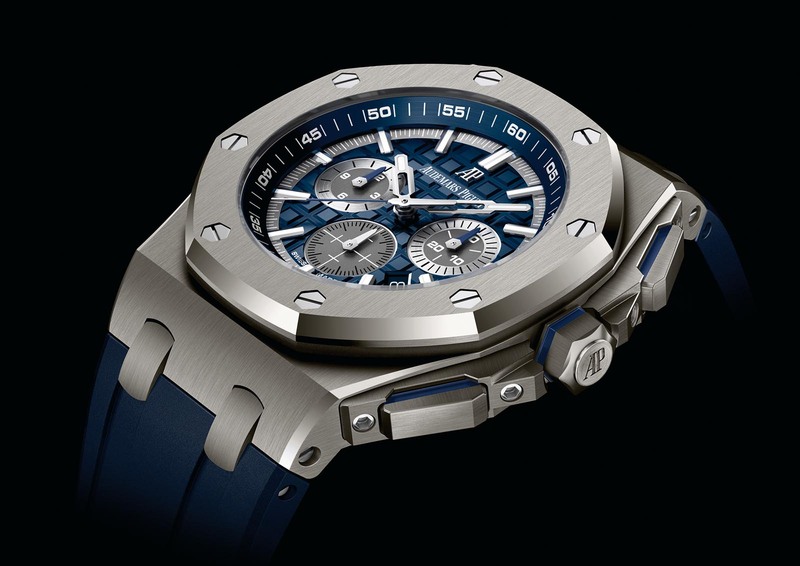 It’s already available at Audemars Piguet boutiques.